Use old cans for display or storage. Simply attach wire and hang them on peg hooks. If you have some old cans lying around – especially from the ’30s to ’60s, Under the Table and Dreaming by Stephanie Lynn has found some great ideas for turning them into something spectacular. From creating great lighting effects to retro-decorative storage, her blog features 50 crafts for repurposing old product packaging. 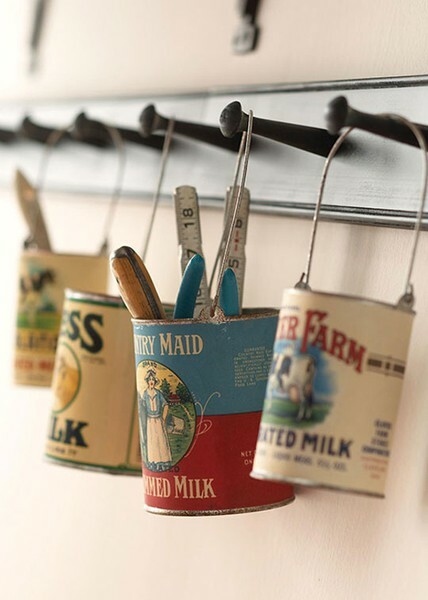 Among our favorite is one of the simplest ideas – attaching handles to old cans and hanging them on peg hooks. You can use them for decor only, or as pencil and tool cups. Other ideas include a bird feeder, totem pole, coin bank, pedestal stand and wall container garden. Does your home decor include any vintage cans like these? We’d love to see the pics and gain some more inspiration!